4. Meanwhile, heat 1/4 -inch vegetable oil over medium-high heat in 10- or 11-inch sauté pan. When edge of meatball dipped in oil sizzles, add meatballs in single layer. Fry, turning several times, until nicely browned on all sides, about 10 minutes, regulating heat as needed to keep oil sizzling but not smoking. Transfer browned meatballs to paper towel--lined plate; set aside. 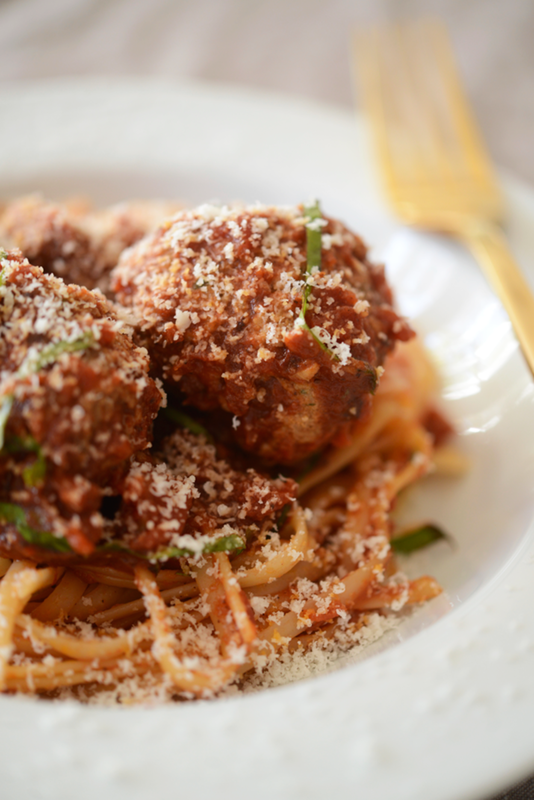 Repeat, if necessary, with remaining meatballs. 5. For the sauce, discard oil in pan, leaving behind any browned bits. Add olive oil along with the onion, sauté until softened (5-7 minutes) , scraping up any browned bits. Add garlic and thyme and cook until garlic is golden, about 30 seconds. Add red chilis and cook for 1-2 minutes, then add tomatoes, bring to boil, and simmer gently until sauce thickens, about 10 minutes. Stir in basil; add salt and pepper to taste. Add meatballs and simmer, turning them occasionally, until heated through, about 5 minutes. Keep warm over low flame.